Senate Democrats are mounting a last-ditch campaign to preserve so-called "net neutrality" that has prevented certain content or users from being slowed on the internet in the United States — an effort most Republicans say is misguided and counterproductive. On Wednesday, the Senate will vote on whether to reverse the Federal Communications Commission's December decision to repeal Obama-era rules that barred internet service providers from favoring certain users or material. All 49 Democrats and one Republican, Susan Collins of Maine, back the resolution in the 100-member chamber. 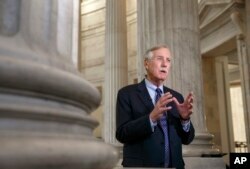 "All [net neutrality] does is protect the openness of the internet to competitors across the country," said Angus King, a Maine Independent who caucuses with Democrats. "I believe this resolution will restore us to a place where small businesses will be able to compete and blossom and prosper." FILE - Sen. Angus King, I-Maine, is interviewed on Capitol Hill in Washington, Dec. 9, 2014. Added Democrat Ed Markey of Massachusetts: "Net neutrality is our 21st century right, and we will fight to protect it. Eighty-three percent of Americans, in polling, say they want to protect net neutrality." Republicans insist they, too, believe in net neutrality, but want to safeguard it by crafting forward-looking legislation rather than re-imposing an outdated regulatory structure. "Democrats have decided to take the issue of net neutrality and make it partisan," Senator John Thune of South Dakota said. "Instead of working with Republicans to develop permanent net neutrality legislation, they've decided to try to score political points with a partisan resolution that would do nothing to permanently secure net neutrality." FCC Chairman Ajit Pai, a Trump appointee, defended the commission's decision at a recent telecommunications conference in Washington, saying antiquated and heavy-handed federal internet regulation slows innovation and discourages investment in cyberinfrastructure. 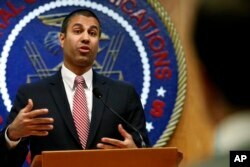 "If you want something to operate like a slow-moving utility [company], there is no better way to ensure that than by regulating it as such," Pai said. "[The American people] want more access, they want competition. They want the internet to be better and faster and cheaper." FILE - Federal Communications Commission Chairman Ajit Pai answers a question from a reporter after a meeting where commissioners voted to end net neutrality, in Washington, Dec. 14, 2017. The FCC chairman added that federal regulators retain the ability to crack down on any unfair practices regarding internet access, and that service providers are required to disclose whether they slow any content or offer paid so-called "fast lanes." Such assurances have not satisfied more than 20 U.S. states that sued to prevent the FCC's decision from going into effect June 11. In Washington, Democrats say small-business owners are worried they will be at a disadvantage in reaching new customers if net neutrality disappears. "It's all about having equal access to the internet," King said, pointing to Certify, a small Web-based company in Portland, Maine, as an example of what is at stake. "One hundred fifty employees. It has two million users around the globe — that's because of the power of the internet. We don't want that business to be choked off by a large competitor who can pay preferential rates [for internet access]." America's largest internet service providers have said they will not engage in "throttling" — dramatically slowing down certain content — once the new FCC rules go into effect next month. The net neutrality resolution could pass in the Senate 50-49, given the absence of Arizona Republican John McCain. From there, it faces significant hurdles. Passage is seen as less likely in the Republican-led House of Representatives, and President Donald Trump is unlikely to sign a bill overriding a decision backed by the FCC chairman he selected. Even so, Democrats see an opportunity to highlight an issue of concern to many Americans ahead of the 2018 midterm elections. "This vote will allow senators to show once and for all where everyone stands on #NetNeutrality," Senate Minority Leader Chuck Schumer of New York tweeted.